LAWRENCE, Kan. – A 30-6 run over the final 8:30 of regulation gave No. 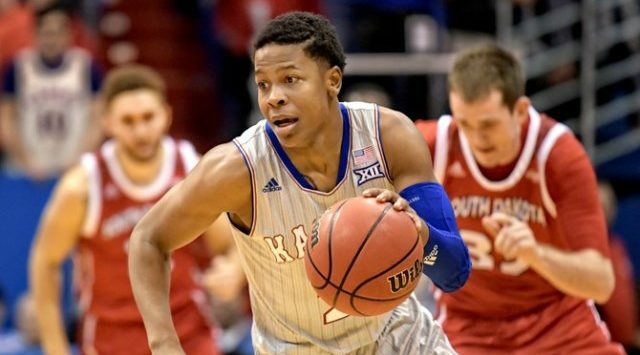 1 Kansas the final separation it needed to take down the South Dakota Coyotes, 89-53, Tuesday night at Allen Fieldhouse. Redshirt-sophomore Charlie Moore posted a season-high 18 points with the help of five second-half 3-pointers, while redshirt junior Dedric Lawson was close behind with 16 points in posting his seventh double-double of the year. The win pushed the Jayhawks to 10-0 on the year, its first 10-0 start since 2010-11, while the Coyotes fell to 6-6 in 2018-19. It was cold shooting opening half for both squads as KU and USD as the two squads combined for seven of their first 25 field goal attempts over the opening 10:30 of the contest. Despite the lids on the rims, KU managed to jump out to an early 9-0 lead. Junior forward Mitch Lightfoot matched his season high in the first half as he led the Jayhawks with seven points. Kansas went into the locker room leading 37-27, the Jayhawks’ largest lead at halftime since its season opener. The Jayhawks had trouble putting away the visitors, who cut the KU lead to 12 points, 59-47, with just over eight minutes to play. But a strong finish saw Kansas turn its lead from 12 into over 35 over the closing stretch. Moore scored 15 of his season-high 18 points in the second half, ending the night shooting 66 percent from the field via a 6-of-9 clip from beyond the arc. His six treys marked a career-high. Lawson added his seventh double-double of the season, with 10 points and 10 rebounds coming in the final 20 minutes, to add to his 16 points and 14 rebounds on the night. After posting only four first-half points, freshman David McCormack recorded a new career-high 12 points and 2 blocks in 17 minutes of play. McCormack pulled down 6 rebounds, matching his season high against Louisiana earlier this year. The Jayhawks shot 64.5 percent from the field (20-31) in the second half and closed out the night with a 51.5 percent mark, including a 9-of-23 clip (39.1 percent) from 3-point range. KU also converted on 12 of its 15 tries from the free throw line, to post a season-high 80 percent from the charity stripe.